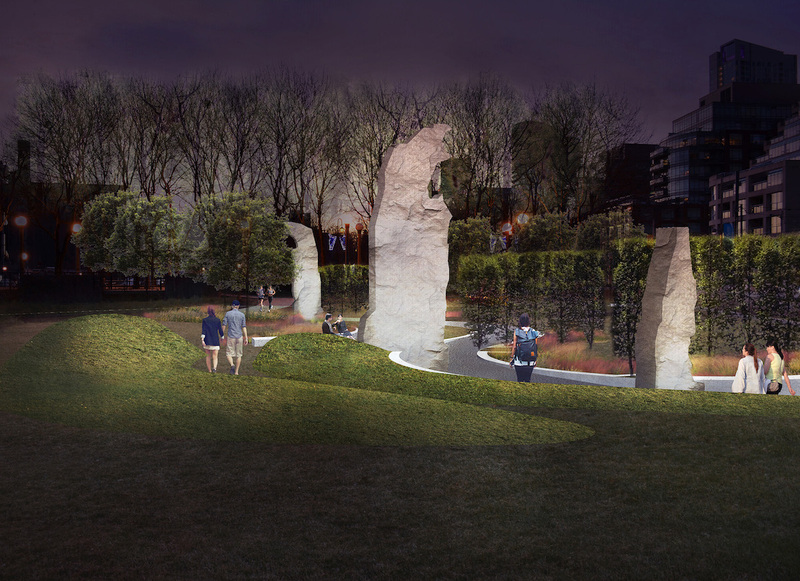 A public art and landscape installation inspired by Terry Fox’s legacy has been selected as a new keystone of Toronto’s waterfront. Led by Legacy Art Project Toronto (LAPT), the new work will be unveiled in Fall 2020 to help mark the 40th anniversary of Fox’s cross-Canada Marathon of Hope. Designed by Jon Sasaki and DTAH, We Are Shaped by the Obstacles We Face draws waterfront visitors along a curving, landscaped path that is obscured by one-storey-high sculpted granite slabs. Last summer, Toronto City Council named more than 4,000 square metres of waterfront space at 439 Queen’s Quay, between the Music Garden and the Spadina Quay Wetlands, as the new home for a permanent, citizen-funded art-park reflecting the values Fox exemplified: innovation, perseverance, courage, community engagement and hope. An open, national design competition, facilitated by seasoned art consultant Rebecca Carbin, Principal of Art + Public Unltd, was conducted in the fall of 2018. The jury, comprised of art and design luminaries, selected the finalist after receiving proposals from five Canadian artist and landscape architecture teams. They chose the winning piece following a reception at Fort York that also welcomed Fox’s biographer, Leslie Scrivener and Councillor Cressy. To support the installation’s construction, the Legacy Art Project invites the support of Canadians in following the project and in donations.